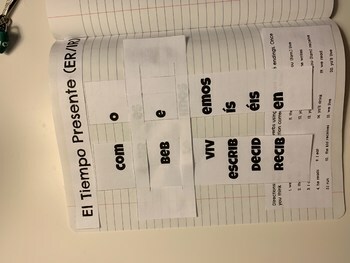 Have your students learned how to conjugate ER/IR verbs in the present tense in Spanish, but you need another activity that will be fun, engaging, interactive, and unique? Then this is the activity for you! 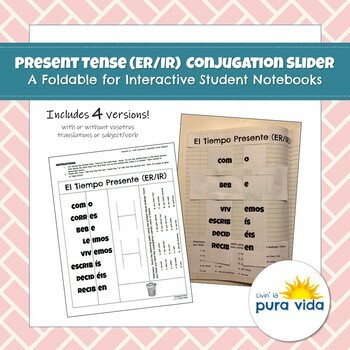 Intended for use in an Interactive Student Notebook, this foldable helps students practice conjugating ER/IRverbs in the present tense by using sliding tabs. It reinforces the concept of removing the ending first and adding the correct ending based on the subject doing the action. By having students move the tabs before saying the conjugated verb out loud, it gives them a chance to think before they speak and also to use different parts of their brain! This foldable has been popular in both middle and high school classes!